In early October 1813 the two armies, one with gold eagles the other with black eagle on yellow standards, were separated by the meandering Weissbach stream, which in this area generally ran south to north. In front of the two armies three bridges crossed the Weissbach. Between the norther and southern bridges the banks were firm. Outside this area the banks were less defined and often broken by traditional ponds and marshy banked. As the two armies deployed, banners flapping in the wind a frontal assault by one or other of the combatants seemed likely. In general terms the main French and allied armies were north of the Weissbach, with the Austrians holding the southern front. Indeed, Napoleon had pushed his main army east and the Austrians along the Weissbach found themselves southwest of Napoleon and therefore potentially exposed. Prinz Schwarzenburg had deployed on the Weissbach two of his Austrian Korps. The 1st under Colloredo and the 3rd under Gyulai. To the rear, and available to support any attack, were Graf Weissenwolf’s Grenadier Division and a Cuirassier Division under Klebelsberg. Much of the Austrian army was solid if unadventurous, best described as plodding, solid in defence but arguably lacking in élan when pressing home a charge. The French, commanded by Ney, in contrast were full of fighting spirit but apart from three divisions were recently formed and, unlike the Austrians, they generally lacked drill making the difficult manoeuvre. They comprised Marmont’s VI Corps and the smaller IV Corps under Bertrand. Ney, hoping to achieve a decision in the area of the Weissbach had sent requests for reinforcement from the main army. Yet Schwarzenburg, unwilling to retire, planned to launch an attack. This was thwarted when Ney advanced several French divisions aggressively towards the Weissbach. This was especially so on the French left where the divisions of Bertrand’s IV Corps, specifically Morand’s and Fontateli’s Divisions, advanced against the Austrian right held by Colloredo’s 1st Korps. Some 36 guns formed a grand battery near the town of Lichnau. Opposite the Austrian centre, which itself contained the divisions of Murray and Hessen-Hamburg from III Korps were the two divisions from Marmont’s VI Corps, Compan’s 20th and Lagrange’s 21st Divisions who took up blocking positions ready to exploit any success. On the Austrian left, Crenneville’s Light Division demonstrated forward to pin the French right, which comprised Friederiches’ 22nd Division and Rousseau d’Hurbal’s Light Cavalry Division. 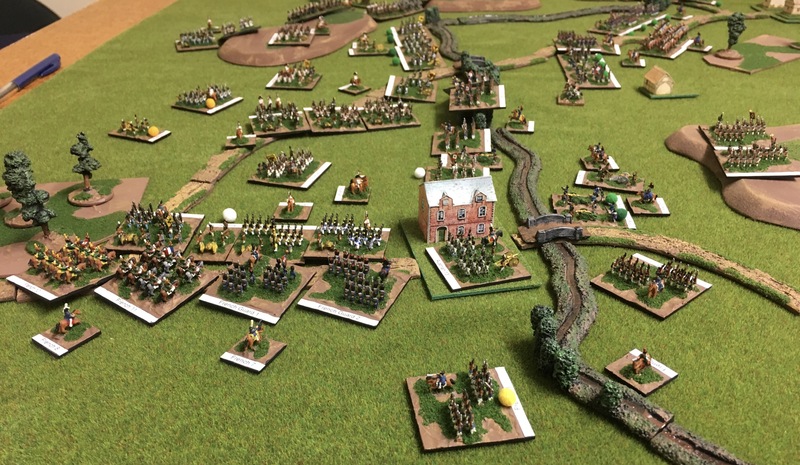 Above, the Austrians, in the foreground, face the French across the Weissbach. The town of Lichnau is visible on the right. Several Austrian brigades have become disordered by the French artillery forming opposite. Soon, however the French divisions detached by Napoleon approached the Austrian flank. Now all hope of an Austrian offensive was gone. Below, Curial’s Guard Division and Defrance’s Heavy Cavalry Division advance on the right rear of the Austrian line. Schwarzenburg ordered Colloredo to realign the right flank and repel the expected attacks. Simultaneously reinforcements moved to form a second line. The town of Lichnau would become the corner of the line which now turned at right angles to the Weissbach stream. No sooner had Greth’s Division redeployed than the French attacked. Above, the French attacks can be seen attacking Greth’s Division, while Wimpfen’s Division forms to the rear. Simultaneously the Austrian forces are subjected to attacks along the Weissbach. Austrian resolve, though tested, held. 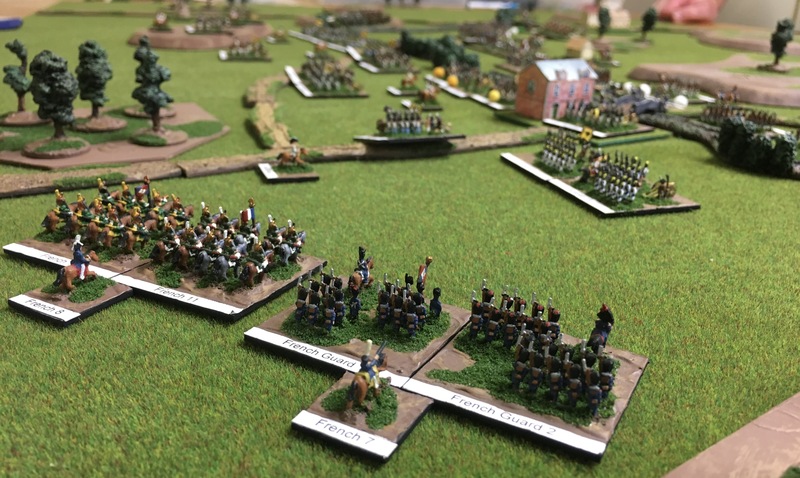 As a result the Guard and cavalry attacks were repelled with massive casualties. With the right flank stabilised Schwarzenburg now ordered counter-attacks along the Weissbach to drive back the French and Italian troops who had crossed near the town of Lichnau. 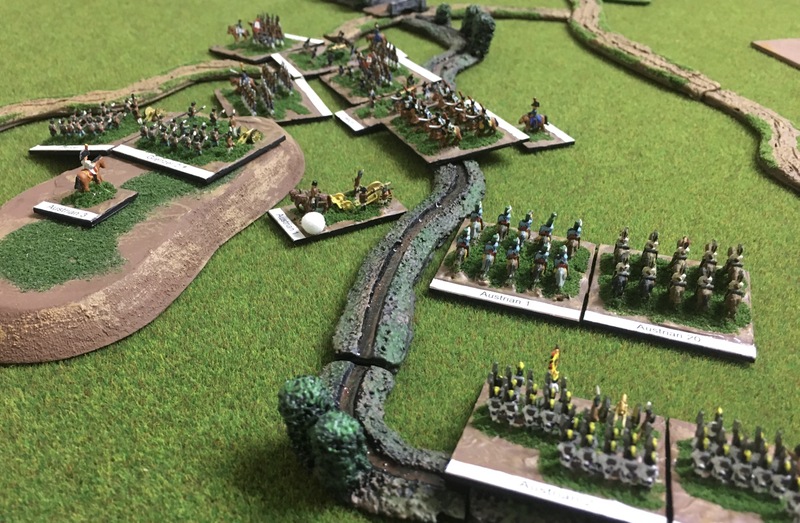 Above, elements of Wimpfen’s 2nd Division engage in counter-attacks while Austrian converged grenadiers, under command of Wissenwolf, advance in support. 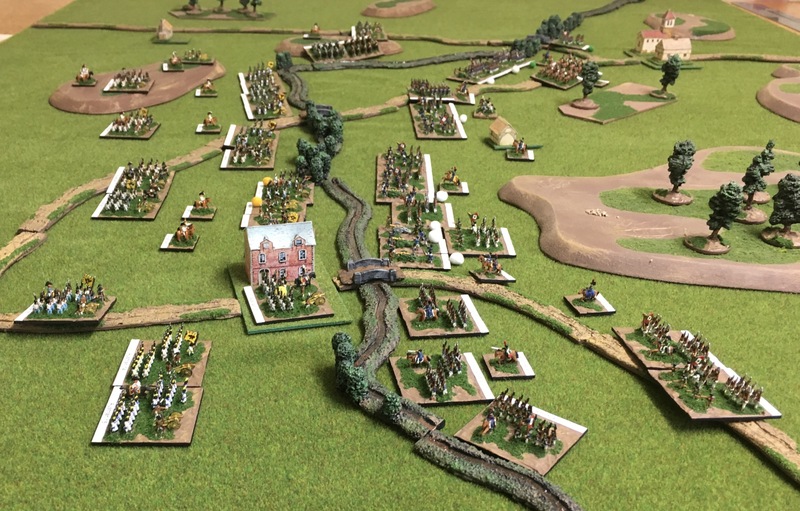 Below, additional Austrian formations can be seen engaged along the Weissbach, while Austrian Cuirassiers have advanced forward and prepare to exploit any opportunities. While some Austrian regiments would press home their attacks others would attempt to utilise musketry and artillery to dislodge the French. On the Austrian left the situation had also become critical. Friederich’s 22nd French Division, forming Marmont’s right, finally advanced across the Weissbach in a section that ran generally east to west for a short distance. Three French provisional brigades, almost 8000 men surged forward late in the afternoon. They were supported by artillery and Rousseau d’Hurbal’s Light Cavalry Division. Facing them was Crenneville’s Light Division comprised just 3000 Grenzers and 2000 light cavalry. The Austrian cavalry countered, crossed the Weissbach, and routed a number of French cavalry. Below, the situation after a French cavalry regiment was destroyed. 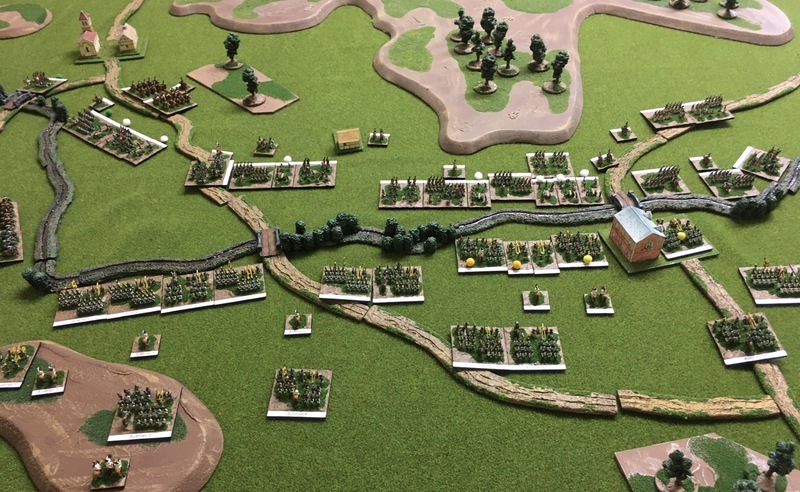 Austrian infantry of Murray’s Division have crossed the Weissbach to reinforce the attack. Alas, the Austrian success was short lived. Friederich’s Provisional Brigades pressed the Austrians and as dusk fell the entire Austrian left collapsed. Now both armies left flanks had collapsed and the centres had fought each other to a standstill. It had been a costly clash which surprisingly had resulting in stalemate. 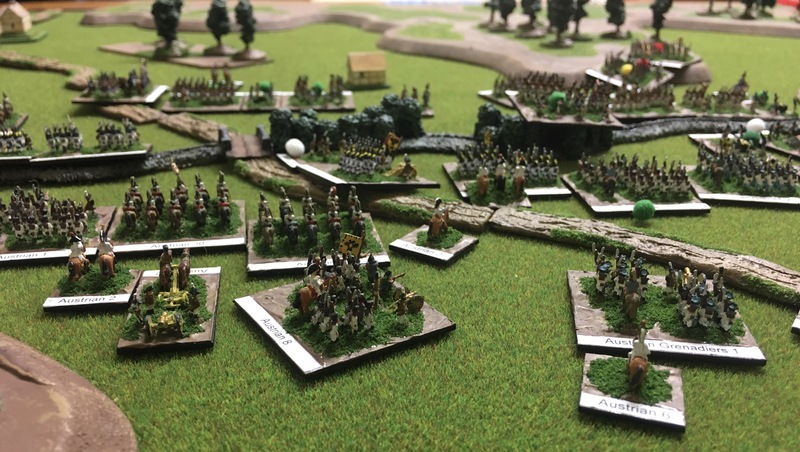 The scenario was developed using 3000 point armies and the “Road to Glory” Scenario System and used my 6mm Heroics & Ros miniatures. 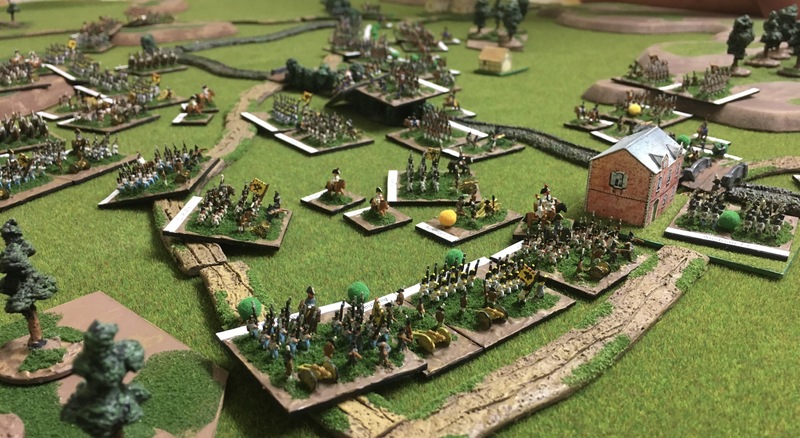 The Austrians had selected card #20, Returning Detachment, which meant their reserve wing comprising converged grenadiers and heavy cavalry arrived during the game. The Austrians expected to be attacking. However, the French players opted to use Card #23, Turning Manoeuvre Left, which placed the French Reserve on the Austrian right. With such a high card the French had the burden of attack. At the end of the battle both armies had sufferd heavy casualties. The Austrians having suffered 29 while inflicting 26. The French Guard had collapsed and several other divisions had been exhausted or were almost exhausted. The Austrians left had collapsed and two other divisions were exhausted or near exhaustion. It had been a dramatic battle for both armies! 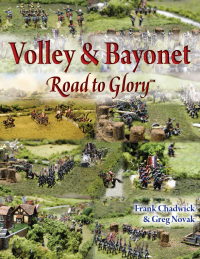 A wonderful and very inspiring battle… I see how nice the point-system for generic battles works in Volley & Bayonet. I will try it soon ! I would encourage people to use the system. It produces excellent games, which could easily be historical refights. Thanks Mark, I can only hope the report captures the flavour of a first class game.